It's no secret around the house that I think boneless/skinless chicken breasts are just this side of worthless. That being the case, I can't deny that they can make for a quick meal. The problem is that they have me on a seemingly never-ending quest to find ways to make them taste like something. This recipe is one stop in that quest. These breasts are stuffed with herb brie which is wrapped in Black Forest ham. The trick was to find a way to get the cheese and ham in there with just a pocket cut in the breast. I wish I could give you a simple way to do this, but it's largely a figure it out as you go sort of thing. Using the palm of your hand (or a meat mallet) on a hard surface, press down (or pound) the thick portion of each breast until they are fairly uniform in thickness (about an inch). Carefully cut a horizontal pocket in the center of each breast using a very sharp knife (I recommend a paring or boning knife). Note: Try not to cut through the outside of the breast. Repeat the process for the remaining breasts. Cut the brie into six slices and mold them to the width of the ham slices. Roll each piece of the cheese with one slice of the ham. Hold the pocket in the breast open with a knife and slide the ham and cheese roll inside. This is the tricky part, so you'll have to be inventive. Perhaps lubricating the roll with some oil would help. If it's too hard to slide in, just stuff it as best you can. Pin the open end of each breast closed with a toothpick. Season both sides of each breast moderately with the BBQ seasoning and let rest at room temperature for about 30 minutes. Quickly grill each side of each breast over direct heat until they are seared and have grill marks. Move the chicken to the indirect part of the grill and cook until the internal temperature reaches 160º. Melt the butter in a medium sauce pan over medium heat. Add the remaining sauce ingredients and stir until it is well-combined. Cook at a simmer for five minutes, remove from the heat and set aside. Remove the breasts from the grill, drizzle with the sauce and let them rest for five minutes. 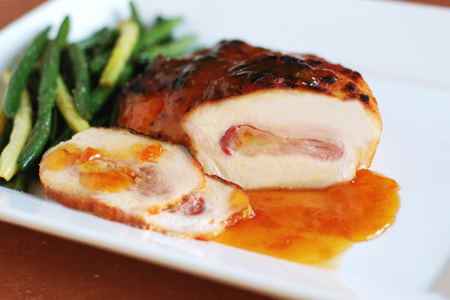 Drizzle each breast again with the sauce, serve, and enjoy. This looks delish and my husband can not agree with you more, He thinks that chiken breast are nothing more than filler for a meal. So we will be giving this one a try. Best cordon bleu ever! I've cooked it the traditional way, both fried and roasted, but this is the best. I used a shortcut w/the sauce - used American Spoon's Apricot Butter and white wine. Delish and easy. Anonymous - Thank you for your kind words. I'm really glad that you enjoyed it.